The venerable 34.56 motor yacht Shaha, listed for sale by Bjorn Vang-Mathisen at Ocean Independence, has had a €450,000 price reduction. Built in steel and aluminium by French yard Socarenam to a design by Andre Mauric, she was delivered in 1978 and has had the same owner for the past 12 years, during which time she has been constantly upgraded and carefully maintained. Accommodation is for up to 12 guests in six cabins consisting of two twins forward and four cabins aft - a double and three cabins convertible from doubles to twins. There is not really a dedicated ‘master suite’, although the forward two of the four aft cabins could be combined to make a spacious, permanent or flexibly convertible space. The saloon and dining room are in one open space that bears witness to the generous beam of the yacht. Near the double doors to the aft deck there is a bar and all soft furniture was recently re-upholstered while the dining table seats 12 in comfort. The sun deck is vast, with both loose and fixed furniture making it perfect for al fresco dining and for sun bathing. There is a flybridge steering position on this yacht for sale, but the deck is really for owners and friends to relax and enjoy the outdoors. Shaha had a major refit in 2011 which included stripping her hull back to the bare steel, a full repaint and she was retro fitted with zero speed stabilizers. 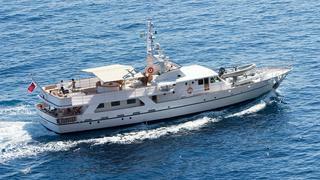 Twin 450hp Detroit Diesel engines give her a range of 3,500 nautical miles at 10 knots. Lying in Malta,Shaha is down from €3,250,000 to €2,800,000.